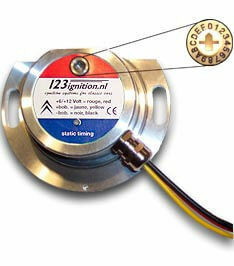 The 123ignition\UNI is designed for all STANDARD 2CV engines that were ever produced. The appropriate advance-curve can be selected with a 16 position rotary-switch, behind an opening in the front of the housing. The unit will work on 6 volt and on 12 volt systems. The 123ignition\UNI is designed to work on 2CV 9 hp, 375cc, A53, M4, A79/0, M28, A79/1 and M28/1 engines in conjunction with the stock black coil. (6 volt type for 6 volt battery, and 12 volt type for 12 volt battery) The dwell is automatically adjusted. Upon installation, the user has to check his engine plate (“A”, “AZ”, “AM”, “AYA”, “AM2”, “AYA2”, “AK2”, “A06/635”, “A06/642”, “AM2A” or “A06/664”) and look in the manual which setting of the rotary-switch is appropriate. There also is a special setting for M28/1-engines running on LPG or on Ethanol, like ‘E85’ as used in Sweden. (‘E85’ contains 85 percent ethanol, and 15 percent standard fuel).